Autotune-loving rap phenom Future has been putting off his delayed Honest LP for some time, but the album now appears to be nearing completion. Over the weekend, he shared more details about the project. In an annoying move, he revealed the album's cover art via nine separate Instagram posts. Pieced together, the puzzle forms the above image. It's a fairly simple cover, though is still offers some piercing honesty via a striking shot of the artist's eyes. Speaking of being honest, the Honest LP now has an April 22 release date via A1/Freebandz/Epic. 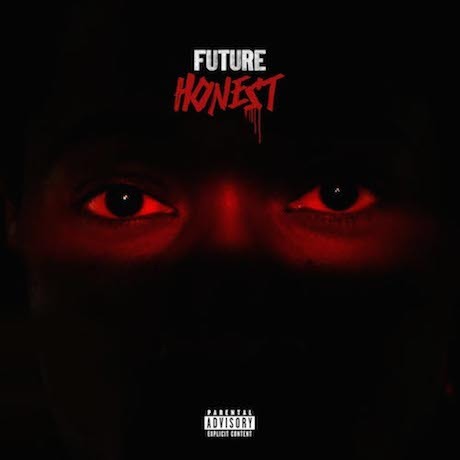 Since this entire album is about Future just being honest, we're going to be super pissed if that ends up being a lie. Most recently, Honest's star-studded "Move That Dope" track was treated to a video, which you can enjoy below. UPDATE: Below, you can now see the tracklist, which features Kanye West, Drake, Pusha T, Pharrell and more.